Data is from the September 2016 TVTY report titled "Mastering Moment Marketing" conducted by Censuswide. 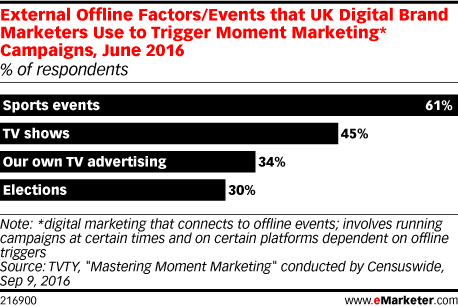 200 UK digital brand marketers were surveyed in June 2016. All respondents were from companies with revenues of at least £1 million. The retail sector accounted largest segment of respondents (30%), followed by technology (19%). Agency-side digital marketers were excluded from this study. TVTY enables advertisers to synchronize their digital campaigns with offline events in real time.